The recipe I picked for this week’s Gourmet Live 50 Women Game-Changers selection that I and my fellow food bloggers post about each Friday is probably the most versatile one I’ve come across. Especially if you like Mexican food. Zarela Martinez is the featured chef. She was the owner of a popular Manhattan restaurant named after her from 1987 to 2011. She specialized in regional Mexican cooking, and she still caters special events, gives cooking lessons, and lectures on Mexican cuisine and culture. 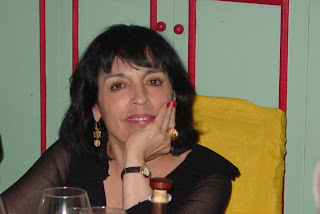 She is the author of Zarela’s Veracruz, The Food and Life of Oaxaca, and Food from My Heart. You can learn more about Zarela at her Web site. I made her beans fried in butter, or in other words, refried beans. Traditionally, this dish is made with lard, bacon fat, or olive oil. The butter gives it a lovely rich flavor. Also, while it takes time, it is an easy dish to prepare. And it has so many different uses. Add some sauteed green peppers and Mexican spices (chili powder, cumin, etc) and it makes a delicious bean dip. Sprinkle it with cheese and it’s a side dish for your next Mexican meal. Place the beans in a large saucepan or Dutch oven. (For best results choose a deep rather than wide shape; in Mexico beans traditionally used to be cooked in a narrow-necked clay olla (pot).) Add enough cold water to cover the beans by at least 2 inches. Bring to a boil over high heat, reduce the heat to low, and cook, partly covered, for 25 minutes. Add 2 teaspoons of the salt (it toughens the beans if added earlier). Drain the beans in a colander and reserve about 1 1/2 cups of the cooking liquid. Grate the onion on the fine side of a box grater, or chop coarsely and grind to a puree in a food processor. Set aside. In a heavy medium-sized skillet, heat the butter over medium heat. When it foams, add the onion and cook until just lightly golden, about 5 minutes. Add the beans stir to mix thoroughly, and cook, stirring occasionally for 10 minutes, until the beans are thoroughly imbued with the butter flavor. Taste for salt and add up to 1 teaspoon if desired. When I was in Mexico I even had beans for breakfast!!! The red carrots tasty like the orange ones, but I think the yellow ones were a little milder. I love this series, it's so much fun learning about all of the ladies. I bet the stories they could tell. Looks like you are quite the writer yourself. Hope you have a great weekend. I had something similar to this when I was in Mexico City. Very tasty! Hummm, beans for breakfast...not too sure about that one. :) I know some in the UK (I think Scotland) enjoy them as well. Gina, thanks. And now I'm on the lookout for those multi-colored carrots! Mary, what a great idea! And I love Mexican pizza. I'll give it a try! Veronica, I was surprised how a recipe with so little ingredients could have such a wonderful flavor. I have always wanted to make fried beans. Your recipe looks so inviting and very tasty! Nice post! Have a great weekend! I toyed with making beans to supplement the chile relllons that we had to honor Zarela , but I didn't ... now I must try this preparation! How did I miss this post? Gratefully, my omission has been rectified as my husband, The Brit, will LOVE this for breakfast!